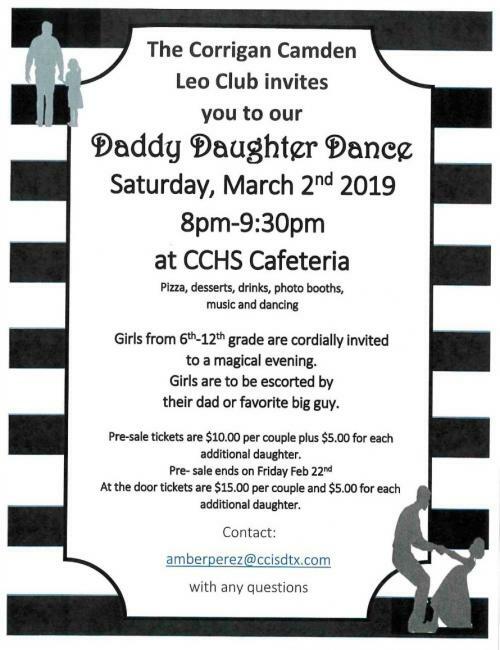 The Corrigan-Camden Leo Club invites you to our Daddy Daughter Dance Saturday, March 2nd, 2019. Pre-K to 5th-grade girls and their fathers will dance the night away from 6:00 until 7:30 pm. 6th to 12th-grade ladies will dance with their dads from 8 until 9:30 pm. Pizza, desserts, drinks will be served. There will be a photo booth for pictures and video will be streamed for your family to enjoy from home. and their Invitations were sent home with Elementary girls. Jr. High and High School girls may pick up invitations from the front office on their campus or see Mrs. Perez. We are looking forward to this magical event and hope to see you there.